CAPE CANAVERAL AIR FORCE STATION, FL – Alas SpaceX is now targeting Friday March 4 for the 5th attempt to launch their upgraded Falcon 9 carrying the powerful SES-9 commercial telecommunications satellite, following another pair of launch scrubs earlier this week due to errant boats and strong winds aloft. “We’re now targeting Friday, March 4 at 6:35 pm ET for launch of SES-9,” said SpaceX spokesman Phil Larson. Sunset is at 6:25 pm. SpaceX hopes for a liftoff of the Cape’s first Falcon 9 launch of 2016 from SpaceX’s seaside Space Launch Complex 40 on Cape Canaveral Air Force Station, Fla. at the opening of a 91-minute launch window. The weather prognosis looks very favorable. Air Force meteorologists are predicting a 90% percent chance of favorable weather conditions at launch time Friday evening. The view, if all goes well, should be absolutely spectacular Falcon roars off the launch pad and thunders to space. The only concern at this time is for cumulus clouds and upper-level winds. “A stray shower may accompany a weak frontal boundary as it nears the Space Coast late Thursday night through mid-day Friday,” says the Air Force. “The front should move through the Spaceport by Friday afternoon, bringing gusty northwest surface winds, which will weaken after sunset. Skies are also expected to clear behind the boundary with only a slight weather concern of lingering cumulus clouds. Maximum upper-level winds will be from the west at 100 knots at 37,000 feet. It begins about 20 minutes before liftoff, at approximately 6:15 p.m. EST on Friday, March 4. The fourth attempt to launch was scrubbed early on Tuesday afternoon, March 1, long before fueling of the rocket began, due to the threat of dangerous high altitude winds that could result in destruction of the rocket. “Pushing launch to Friday due to extreme high altitude wind shear,” tweeted SpaceX CEO and founder Elon Musk. Since strong high altitude winds were expected to persist for several days, the launch was postponed to Friday. “Unfortunately upper-level winds continue to exceed acceptable limits and are expected to get worse as we approach tonight’s launch window, so we are forgoing today’s launch attempt,” Larson explained. 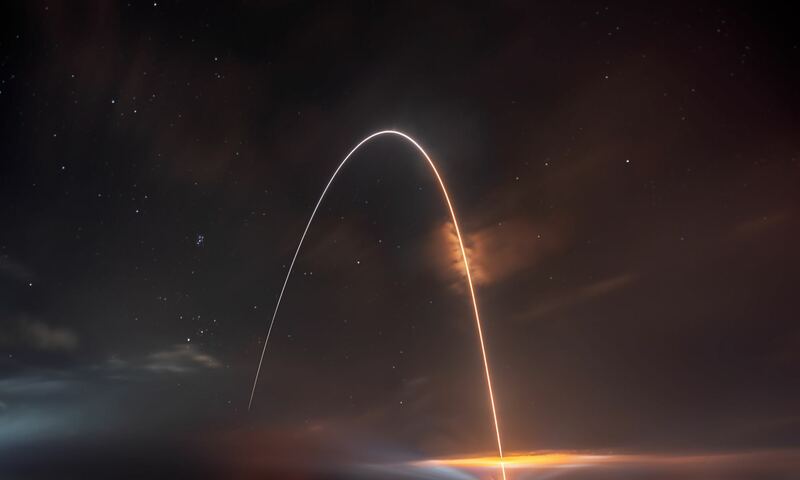 The SpaceX Falcon 9 rocket came with a second of liftoff on Sunday, Feb 28 when the launch was aborted by a low-thrust alarm. Watch for Ken’s onsite launch reports direct from Cape Canaveral Air Force Station in Florida.